where I am very curious.. or am curious to return to is your critique (well taken.. much WANTED) of how I did mountain ranges. I looked back over my maps.. and the one I liked the least and was going to go back to was the one that sounds like you might think I did best. At some point I do want to return to that subject and discuss modeling mountain ranges. oh yeah.. all things being equal Robin.. I really wish I had paid more attention to what you were doing when I started this or hadn't started till our interest in Glantri overlapped. As I said, you are far better/knowledgeable at this than I am but it simply too late for me to go back and change things. Take Wylon.. i LOVE your non linear (for lack of a better word) dominion borders. Yes I did notice how you tied borders on natural features, like the rivers, much MUCH more natural than standard dominion border. However to go back and change things.. considering I've done roughly half or more of Glantri already... and that took a lot of time. I'd never be able to move forward if I went back haha. So one change obviously from mine to yours will be keeping the standard rote dominion borders I established with my maps from the very beginning. I absolutely understand the love for detail and variation...it so livens up the area. But then I need sharp pictures...for the links thus far don't give me usable sourced material that can be dowloaded sharp. You may also mail me the maps directly if so desired on my gmail. np. understandable. to redo everything is ...ouch.. to much work. I have often wondered the best way to show them on these maps. Show them all.. just the important ones... but very often none of them are important. I have leaned, but never did, towards showing all the villages on the map. Take a hill hex in Wylon. approxmiately 280 people live in a 8 mile square area. Villages are gatherings of population from what 50 people on up to that point where a village becomes a town. None of the domioins supported a 'town' sized settlement. But in reality there could be a quite a few valliages. Take for example that some player out there really likes this map of Wylon and thinks Threshold is road kill man and thinks.. hey.. I'll base my starting party there. Wouldn't it be best to have a near complete presentation of the dominon. Granted not every one has to be detailed in my writeups.. oh this village.. a farming village.. .this one? oh that is a farming village. oh that one? HAH! that is a mining village! Perhaps I might want to consider showing ALL the settlements above a certain threshold hold. We can name them, names are easy, but only the important ones get put into the dominion write up. so say what.. 50% of the population is urban, the other half rural... you might see what 2 villages per 8 mile hex on the wylon map. One in the mountains. That I might revisit with the maps I've already done. Robin wrote: I absolutely understand the love for detail and variation...it so livens up the area. it is at this point, honestly Robin for something that I am the likely the only one that will actually use the things. I am a perfectionist no doubt, but a sane rational one. If there was real interest in others using them, yeah, I would in a heart beat. This whole project was a creative release and a ton of fun, and damn educational. The quickest way to ruin it is to make it 'work'. 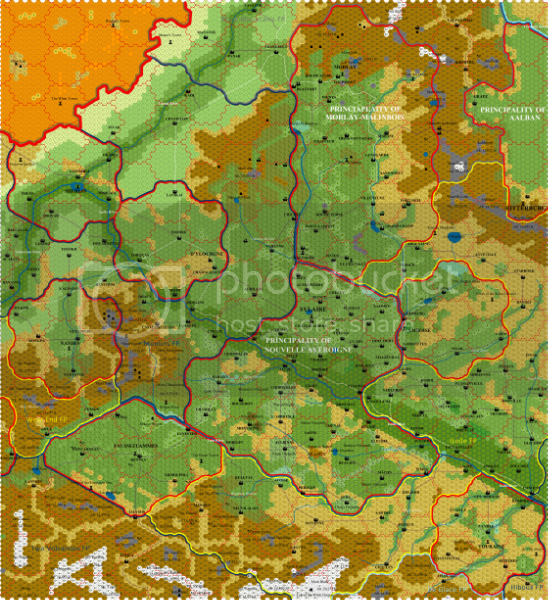 here is the dropbox link to my hexographer files and very large map images. The only one that might not be in there is the Upper Vesubian, it wasn't, so just uploaded it. if for whatever reason the link or the images don't work for you.. let me know..
You have a very few real Cities on Mystara, including Glantri city...which on a 1 mile hex map would cover 1 hex for the inner city and 3 to 5 for the outer city, this due the vastness of population in ramshackle structures in the Norther (NW to E) outskirts,and the lack of high rising buildings. The same to Thyatis, which would cover an area of 10-15 1 mile hexes.just to name 2. I use the canon Cities, towns and villages, and added Hamlets to the row. Cities have over 100.000 inhabitants, towns over 10.000, villages over 100. You could add large villages at 1000-5000 in between. Hamlets are rarely more than 50 inhabitants. I then added those settlements listed in Your and other's descriptions as best as I could while befitting sociocultural behavioral...there is always a reason why a settlement chooses a location, mostly these are geological or biological (aka. agricultural) sometimes these are sociocultural created by war, commerce, produce (plant/geological/animal)and faith. War and commerce are ordained again by the routes the geological andd biological barriers create, and thus most locations seem very logical. Some(especially in a magical and immortal influenced world are chosen by faith or available magic and chosen as this. Reflecting this to the Redstone area. After merging the maps you saw I noticed a familiar round shap resembling proof of an ancient meteor impact. Combining canon and RL together I this came to the conclusion the Center area mountain is actually the remaining red stone meteor...thus possibly metal...which is an important ore, and thus would reasonably place a settlement nearby. as this grows in number, more ground is needed for food production and thus more settlements arise following the geo-biological variations of the area. This 5D thinking of me on a map or area makes the map alive, like I did with The Broken Lands and thus the bordering Glantrian/Darokin areas (http://pandius.com/Broken_Lands_East.png all by using geomorphologyhttp://breathofmystara.blogspot.nl/2016 ... overy.htmlbased on all canon AND fanon sources glued together. This is what it makes an area alive...and I even delved into the future as you'll be seeing soon in the new Threshold . The problem with Mystara mountains is twofold. You would imagine tectonic plate movement...but then you forget that Mystara is a living planet , with a cellular structure. Some of thes cells, rotate, tilt, rise or sink, this causes mountains and plateaus (of which there seem to be a lot). Even if tectonic vast areas would move together , fold over or against eachother along the whole line the tectonic plates touch, as long as the rotation underneath through the magma core pushes the tectonic plates (and in RL these are like the peel of boiled milk still on the milk, push that either side and you'll get "mountains". In the case of Mystara you have cellular structures. Each cell has a function, like in any organism. NW glantri seems to have a lot of volcanoes (either dead, sleeping or active or even eroded away (following the PC4 wherewolf map, where many, really many dead or living or eroded volcanoes can be located)) This would imply the region was damaged earlier (and this could be millions of years ago). Like a pebble thrown in the milk layers, if the milk still is hot, new fat will fill the holes, the holes being the damage, and the milk the magma/volcanoes, the combined effect the creation /reshaping of the surface area into a mountanous region. Secondly I thought about your display/mapping of a lot of singular mountains together with a small line of hills inbetween. This not only deems illogical, but in either tectonic or cellular opinion would deem impossible. At best the hills in between would slowly rise, come together at many points and thus combine as a vast single mountain chain. This would affect erosion by water/weather and each valley would have a stream/creak that flows down from the glaciers, recollected rainwater, and collected water into springs,until the water streams recombine into rivers and/or lakes. This is the reason I created Alpine meadows to differentiate the altitudial differences of the hilly terrain before going over into mountain terrain. The only pok-marked mountain (this is how I call your current style of mountain making) solutions I could find in biology is a disease boiling from underneath, or a vast scab pushed up by new material from below. Both could in theory result in more singular mountains, but even then the areas in between will combine together at many points and succumb to the same erosion we have in RL. I can try to explain more if needed. Either way, your work is awesome, and if it needs some changes, these should be minor touchups. btw...I can't find volcanoes on your Nouvelle Averoigne map even though PC 4 displays them. Forgot them?. you did however place volcanic broken lands. Btw the maps I could now (with continuous going back and forth from and away your link) download and are fine. I'll give you a 4th draft of the Redstone map tomorrow. with some adjustments to the mountainchain Silver Sierras.. but it is a bit late here (2300) and tomorrow I have to do some work before more D&D joy. so to bed I go. To the vast empty area between Redstone, Wylon, Blackhill, on the map thus far I can use any input btw. I also remove some minor flaws from the Broken Lands map West before and the one after meteor as that is my goal to finish this before this years New Year on the 21st december. Thanks for the advice Robin. I want to fix the Upper Vesubian. I was quite proud of that map, and conversely so disappointed when I blew the mountains.. ..sky high. I tried to post a picture of it.. but it was too big. Updated what I have done so far in the dropbox folder. Doesn't look like a did much but I did. The tedious work marking off dominion and Free Territory borders. oh and one last thing about the mountains and take your time Robin. I'm one of those lollygaggers who never got with the times. I don't have a smart phone, tablet, just got a GPS last year and still have my dented and scuffed flip phone so I'm not usually around online during the week nor get much work done. The map I thought I had really blown was the Sablestone map.. when you have a moment...if you can do me a favor and take a looksie at that. The differences are striking. I thought I had undermodeled it, yet if I am reading you correctly, I may have done the better job with that one. Let me know what you think of that. micky wrote: oh and one last thing about the mountains and take your time Robin. I'm one of those lollygaggers who never got with the times. I don't have a smart phone, tablet, just got a GPS last year and still have my dented and scuffed flip phone so I'm not usually around online during the week nor get much work done. It is cool...it makes the area even more alive and changing, according nature...something we forget, a world is ALWAYS slowly irrivocally inevicably changing. I know of the Glantri City expansion map...it was unfinished, but really cool, continue to do so. maybe trying a vast hex overlay of 1 mile hexes according the map, OR...remap the whole city inside a single 8 mile map... ...yes I know I am mad . Another tip that popped up in my head; Simply lay your hand flat on the table. The hand is the mountain the table the flat lands and inbetween the valleys that slowly rise up to the mountain. This is a common mountin and usable anywhere. I have seen it. If copying my map take care to place it all on the same locations..this can be tricky sometimes. Best do the hexes first, secondly water and later add the details later (like settlements, roads, trails, crystals, monsters, etc) and then names. This to prevent ommisions and flaws. To Sablestone...I am gonna explore it.. critizize it...make addon/improvement suggestions where needed. btw I still work on an old pentium 3 PC, have a Nokia 3310, no ipad, no techwhatever, as it does not bring me anything I need. i caclulate on my old school calculator, or my oldSlide ruler and my personal library holds 40 meters of books if placed side to side(i've never counted them ). I've learned survival and used that in my homeless period to survive. I can work/survive with alnost nothing, I don't need those gadgets, that people seem to grown so addictifly upon. I fail and those people can't function no more and panic runs in...non not with me. I still have a question about Swurtins...I had placed it somewhat NW of Wylon, but on your Redstone map it is SW of it instead, within the Silver Sierras free province. Or do you have other solutions on this matter? As to the Southern Free Province...this is very very fragmented, with Nathrat, Soth-Kabree in between. Politically it could indeed belong to one single province, but in effect the section North of Soth-Kabree would either be more reliable be controlled by either Blackhill or Soth-Kabree, while the section West of Nathrat would be 99% uncontrolled and part of the Silver Sierra free Province. The only "controlled" area would be around camp/later ford Huledain from Soth-Kabree unto Darokin, from the Cliff of the Broken Lands to Nathrat. The region to become Ritternour is also not much under control. There seems to be a geological change happening... as in 1014 AC it has several small lakes. In the canon Great Crater after 1007 AC this can be explained by pressure and pressurized relocation of water. In your non-meteor case this can only logically be explained by a similar reason, but a different cause. The best cause to solve this is that the lavatunnels underneath Nathrat, that some of these (maybe even dead magma chambers) were filled with water over ages and that new volcanic activity underneath Nathrat presses this towards future Ritternour. However, this would then be visible (measurable) before in 1000 AC as the hills seem to bulge somewhat before the water is released. In the canon Great Crater version this happens much faster and within a single year. Eitherway the first water breaks through in 1008AC and the last lakes open on 1010AC. In either case this is an interesting active geological area. 2 created altitude by creating mountain ridges, iced mountains and iced mountain ridges, and Alpine Meadows (this will be expanded). I could not stop my blundering storm of Ideas and created the following story for Redstone. The Legend of Redstone Valley. As Told by Paramion the Scribe during a lecture for the young lords and ladies of Redstone nobility. Within the vastness of the Silver Sierras a now well-known witch had settled, in a large valley with a lake created by molten snow. She is as thin as a skeleton, her nose is so long that would rattle against the ceiling of any hut, a beak full of rotten teeth, but sharp as a dagger. Long slender arms with clawlike nails, and a skin so caked with dirt it almost appeared green. Her name was unknown in those days. But she was known even before the Rain of Fire, as Baba Yaga. When she appeared, a wild wind began to blow, the trees around creaked and groaned and leaves whirled through the air. Shrieking and wailing, a host of dead Blackmoor spirits accompanied her on her way. Being a somewhat secretive lady, (in spite of all the din she makes,) she swept away all traces of herself with a broom made of silver birch (what are brooms for anyway?). Amongst her other servants, were three bodiless and somewhat menacing pairs of hands, which appearred out of thin air to do her bidding. The Childred listened in pure silence, their young eyes and ears wide open to engulf the story. Upon the Burning embers of Blackmoor bones, within her enormous kettle she mixed a Solid Cloud, Clumps of the Invisible Moon, Essence of Death and Stars of Winter, then seasoned it with Bird, Pelican and dust of an Earth Elemental Ruler. Stirred it with a totem she first used on her self as a phallic item. She spoke; "Jeza jeza jězě jezinka jędza iaga engti ingti ingas inca ekki"
What was her goal in this dangerous experiment, we will never know, for she failed in her attempt. It was disturbed by a daring fighter hereby sent by Baba Yaga earlier twice. Again he requested the questions asked before; " "Fie, fie," she said, "the Human smell was never heard of nor caught sight of here, but it has come by itself. Are you here of your own free will or by compulsion, my good youth?" "Largely of my own free will, and twice as much by compulsion! Do you know, Baba Yaga, where lies the thrice tenth kingdom?" "No, I do not". Baba Yaga whet her teeth and desires to consume the Fighter. The Fighter saw three horns lying on the table, and as he was foretold, he grabbed them. The first he blew softly, the second louder, and the third louder yet. This causes birds of all sorts to arrived and swarmed the hut. One of the birds was a Phoenix, a firebird, which told him to hop on its back or Baba Yaga would eat him. He did so and the Baba Yaga rushed him and grabbed the firebird by its tail. The firebird left with the fighter on its back, leaving Baba Yaga behind with a fist full of firebird feathers. She followed them within her giant Pestle, blasting one spell after another. Whole mountains were scarrred in the pursuit with terrible blasts of magical power (and thus came the valleys of the Silver Sierras to be). But then the kettle that was forgotten on the burning Blackmoor embers blew up, and flew to the sky. Around the stars, over the moon it flew and then returned, with a vast speed it penetrated the field of Power over the Planet and slammed into the Ground a few miles north of the valley, which such enormous power the mountains there were shattered. All that remained was a vast cauldron-like valley and in the middle within the iron of the huge kettle which onto this day can be found as a large iron Rock rusted Red. What further became of either Hero or Baba Yaga is lost in time, but woe who returned to her site of casting that spell....he or she would surely find power and doom. What do we learn from this tale?...Never ever disturb a witch!! The frightened children were awed by the story, and eagerly dived with their books, instead riding out to the south, where the Valley Häxa Pannadal (which actually means the Witches Cauldron Valley) can be accessed by the Gate of Kostianaya Noga ("Bony Leg" an ancient epithet of Baba Yaga). not done much but added some hexes here and there, improved the Amsorak Coastline, added a few mountain and other names. Mnt. Kratern Asikte (Translation; Mnt. Craterview) From here a wide unobstructed view of the redstone valley is at best. Mnt. Sotberg (Translation Mount Soot) Turned black by volcanic soot. Vulkanberg (Translation; Volcano mountain)...up to this day Phoenix birds nest within this region and can be seen hunting regularly. A gate to the Elemental Plane of Fire is suggested to exist there. Gate of Kostianaya Noga (Translation;Gate of the Bony Leg). The old glacial valley which hides many sources of magic. Robin wrote: I could not stop my blundering storm of Ideas and created the following story for Redstone. love it... but do think we already had a Baba Yaga archtype already placed by fandom up in the Wendarians. IIRC (it was done by the GPD and was written in with the 'mysterious' birth of Princess Juliana). very nice.. much better than mine. I'll be translating that to the larger map. Robin wrote: I still have a question about Swurtins...I had placed it somewhat NW of Wylon, but on your Redstone map it is SW of it instead, within the Silver Sierras free province. yes.. that is where Swurtens came from! See the Silver Sierra Free Province writeup. It can change of course, but the original writeup had it in the mountains around Wylon, thus I placed it to south and west of it. My writeup is likely easier changed than the map. It is not a problem nor of any specific importance. If you let me know what to change it to.. I can change my document Swurtins to something else. As to the Southern Free Province...this is very very fragmented, with Nathrat, Soth-Kabree in between. Politically it could indeed belong to one single province, but in effect the section North of Soth-Kabree would either be more reliable be controlled by either Blackhill or Soth-Kabree, while the section West of Nathrat would be 99% uncontrolled and part of the Silver Sierra free Province. that is one reason it was considered an armpit assignment within the Glantrian bureaucracy (ranked 15th out of the 21 in terms of prestige).. even before Thar's invasion. It sort of is a mutt region whose only real importance was of being a buffer to the broken lands. One could consider it an area where the only laws that count are those enforced by the sword or spell.. sort of a kindler and gentler Broken Lands lmao... the one area of real frontier wilderness within Glantri itself. The only "controlled" area would be around camp/later ford Huledain from Soth-Kabree unto Darokin, from the Cliff of the Broken Lands to Nathrat. The region to become Ritternour is also not much under control. There seems to be a geological change happening... as in 1014 AC it has several small lakes. agreed.. pre war .. only around Huledain was there any real civilization and again, it served more as a military province (though still civilian administered). After the war it did gain somewhat in stature and the establishment of the border barony (Rittenour IMC) should help stimulate trade and again.. provide greater Glantrian control over the population and resources of those hills. We now need a new name for the village I called Swurtins before. As you see it has a small pasage trail on the NW and it can use the Trail to Wylon. This is a source I slightly adjusted fitting in the region, with map, and came out wonderfully. As to the Redstone Legend. Nice you liked this brainstorm story. I assume Baba Yaga had/has her fingers in many pots and cauldrons, and in many shapes and guises. In my Breath of Mystara Blog she'll soon make her appearance too in the explanation of the wonders of the Streel River. Ethengar and Glantri seem to have some interest for her. Eitherway it is a nice local "explanation" for the crater shape of the region. Surely some of the story will be truth, others just mixed up and gossip. One thing is sure. Some large metal object slammed into the region very long ago, leaving a large section of iron-ore in the middle which to this day is used to mine Meteorite iron see here. it was probably viewed by the rare humans/humanoids living in the region, which coincided with Baba Yaga being active in the region. Maybe she was responsible for conjuring the meteor, or just prophecied it, intending to make use. The main garbled rest of the story is indeed gossip, fear-mongering, ignorance and stupidity...just to explain natural features they could not explain then. I'll Try to fill in the region between Redstone and the Red River towards Blackhill first now, but I'll leave out names. I just focus now on the socio-cultural changes caused by geological and ecological basics available. This will be draft 6. According to your info the region is not over populatated, more on the sparse, but agriculture and farming is done where possible. according to GKoM /Gaz3 I can place some additional locations. further it is mainly suggesting along these lines. i'll keep draft 5 handy, if you're not content, to easily change where needed. just keep me informed if you have some input in the region. I am slowly catching up to you. I've Blackhill. Our scales are a bit off due to different courses of the river but all in all it fit fairly well. I will likely be adding more villages. Normally I show 3 per Principality 8 mile hex in clear hexes. It is a very settled area. Likely putting at least 2 villages per hilly hex. Of course on my map most of those will be ruined.. and there will be some deforestation due to Thar using Blackhill as his breakbasket and main source of supply for his jaunt into the heart of Glantri. The area has only really just started to recover in the time frame covered by this map. Blackhill is indeed populated more. Hence I placed more hamlets than in other regions. You could easily place more hamlets or change existing ones into small villages. Don't forget to look at my 1014 map where I caused Synn to take over the North in an attempt to raise/enlage Blackhill.http://sta.sh/025tofi26nug I know it holds the Great crater effect, but might give you some ideas. As I am still working on the map, some minor changes might come forth from earlier drafts on the bordering regions, but I will now concentrate on the middle region first. Nice you like the map thus far. oh yeah.. speaking of Rivers.... big mistake on my maps. Corrected it on this current one but need to go back to all teh other ones. Especially the upper Vesubian and change the actual widths of the rivers. Most rivers are half a mile mininum in width. Larger ones.. are a mile.. 2.. perhaps 3 miles wide as the Vesubian likely would as it approached Glantri City.. to say nothing of how wide it might be after the Isoile drops into it. I'll be curious to look at your Nyra map to see how wide you made the river Robin. For the time being though.. I did substantially increased the width of the Red River from my map... definitely making it more akin to your map. ^ I'll take a looksie at the map Robin.. I don't think I've seen that one yet. two things for you on Redstone Robin... does that lake thingie on the Red River have a name... and that south western hex of Redstone is a hill hex.. do you think perhaps you might have oversold the clear hexes there??? Scale that up to a 8 sq mile hex.. it would be a clear hex in my estimation. Your call of course.. but I think it could use more hills. I also think the barren hills South should have some more trees (pine I think), but as this region is more wind instead fluvial(water) erosion prone, thus less minerals to feed upon are available. yet still the wetter sections should have some more vegetation, don't you agree? (purple lines), the orange lines I am unsure if they should have forest or not, one way not resembles your map more, one way yes it deems more natural, and sociocultural realistic. no new work on the current map this week. Just going back over older maps and firming up the New Averoigne map since that touches the Sablestone, Upper Vesubian and the in-progress Red-Arnus River maps. My mountain areas needed a lot of work and took Robin's feedback to heart and am MUCH more pleased with with I have now. Also starting the Flausseflammes writeup, as the first of the long delayed New Averoignian write-ups, but that means finally reconciling the Dragonlord books to the already establishing canfandom which seems to have ignored the consequences of the Dragonlord books. A lot of outerworlders are in Glantri, I had hoped to pass them off to a previously existing canon monster class but I should have known better after all the years of fancanon that there were no openings to slide one of those into an outerworlder slot. I did do a spot re-reader of the applicable section of the Dragonlord series to this problem. The only specific details given any of them, other than being 'non-human' was of course the Dragon-kin natives that inhabited that wasted world that Thelyvyn visisited. They might work as one of the various groups of those that settled in the new world post Overlord.. but I don't like the feel of it.. and I need at lesat two groups of outerworlders. Gullavians and Highlanders so if I have to create one.. might as well create two if the first doesn't 'feel' right.